Some dogs love water ... other dogs not so much. Luna the white golden retriever loves water and swims every chance she can get! 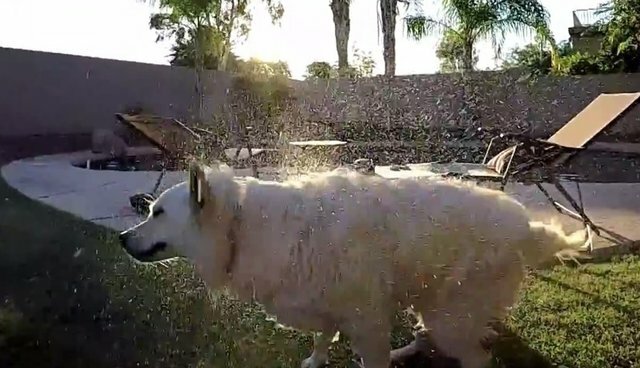 Watch the water fly off of her thick fur in crystal clear slow motion captured with a GoPro Hero 4 Black. Lola the German shorthaired pointer and Ollie the dalmatian are not the biggest fans of rainy days or water in general unless they are drinking it. Watch these two goofy pups shaking of after getting wet all in slow motion. Lots of slow motion wiggling dog butts and even some drool flying through the air in this video!